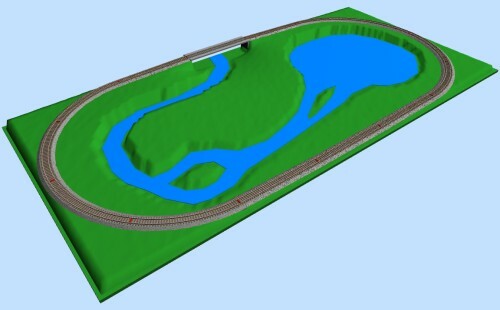 A river or lake on the layout gives a different feeling and more natural look to the scene. Because of this, representing of the water surfaces within the planning software is very important. In SCARM this is reslly easy. You will just need to draw a Polygon figure with a shape of river or lake. Before you begin, take a look on How to work with figures FAQ topic in the documentation, if you are not acquaint with it. 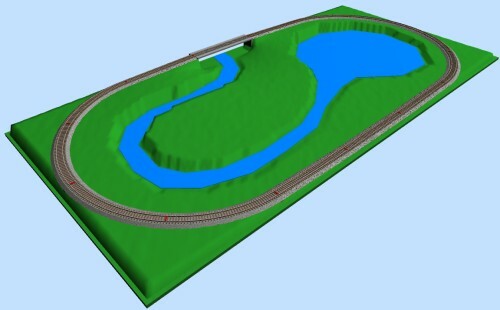 Let’s start with a simple oval layout containing bridge in the upper central area. Now let’s form a shape of a river on the 2D drawing plot, which is moving under the bridge, then makes a turn and finally flowing into a lake. Don’t worry if you do not make the desired shape from the first time – you can always edit it later. To display the Figures in the selection panel, open the Libraries list and click on Figures item, located at the bottom of the menu. 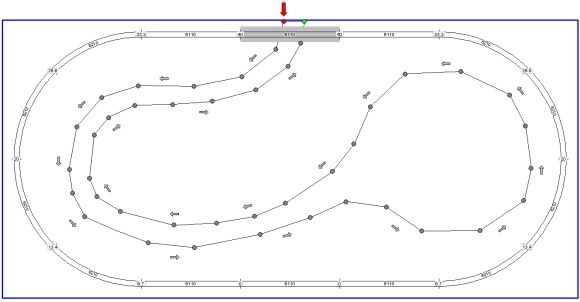 To do the initial shape, select Polygon figure from the selection panel and start placing of the corner points with left mouse button clicks from the red arrow on the diagram below. Note The dots and the arrows in the diagram are showed only for your facilitation. You can always change the properties of a given figure at any time. 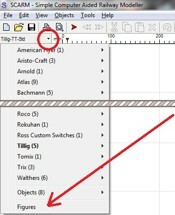 Just select it and then select “Objects” > “Properties” command from the menu. You can also change the properties of several selected figures at once by the same way. Now you can look at yours river and lake and make some corrections if necessary. For example, you can change the shape of the river and make it looking “smoother” by adding more points and moving existing ones. Also, you can add branches with additional figures and by this way make an islands in the river. To insert new point in the polygon’s shape, select the figure, then right click over the side in the place where you want to insert the point and select “Insert new point” from the context menu. To move a point of the polygon, select it, then hold left mouse button and move it. To delete a point from the polygon, select it and press Del key. If deleting is impossible (due to appearing of crossed lines after it), the point will be just deselected. Here is the result with edited river and lake shape and two additional branches. You can practice with a different shapes, experiment with colors and other properties, add small figures in the river for representing of swift current (see below) or choked wood and so on. You can also download the sample layout from the links below and edit it yourself. This entry was posted in Tutorials & Examples and tagged canal, irrigation, island, lake, river, sea, surface, water by Milen Peev - Author of SCARM. Bookmark the permalink. No, that is not possible in current version of SCARM, but such feature may appear in some of the next versions of the program. Yes, it is cool and is now available for SCARM v. 0.9.34 or higher. 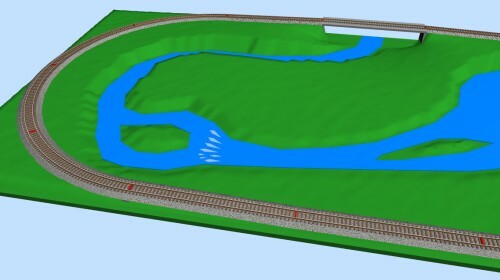 See more here: Model Trains Simulator for SCARM software. This creates the “paddy field” effect but usable. Can’t tell anything without seeing the project file. Send it to and I will then review it and reply.